This listing is for 1 “Mr & Mrs” cake topper made of 1/8” thick, recycled eucalyptus board. 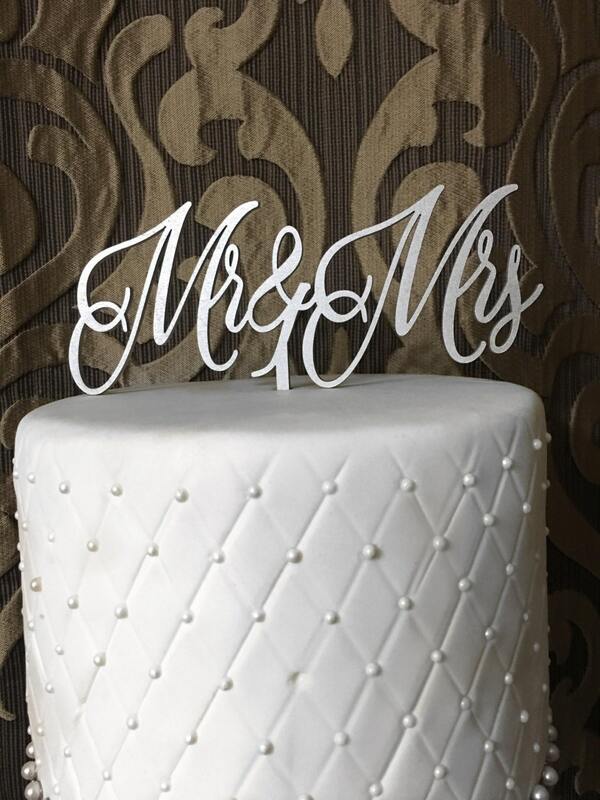 The cake toppers wording is 7” wide and 3” tall. The stick to go into your cake is 4” tall. This cake topper is available in: gold, gold glitter, silver, silver glitter, rose gold, rose gold glitter, black and DIY (unpainted). 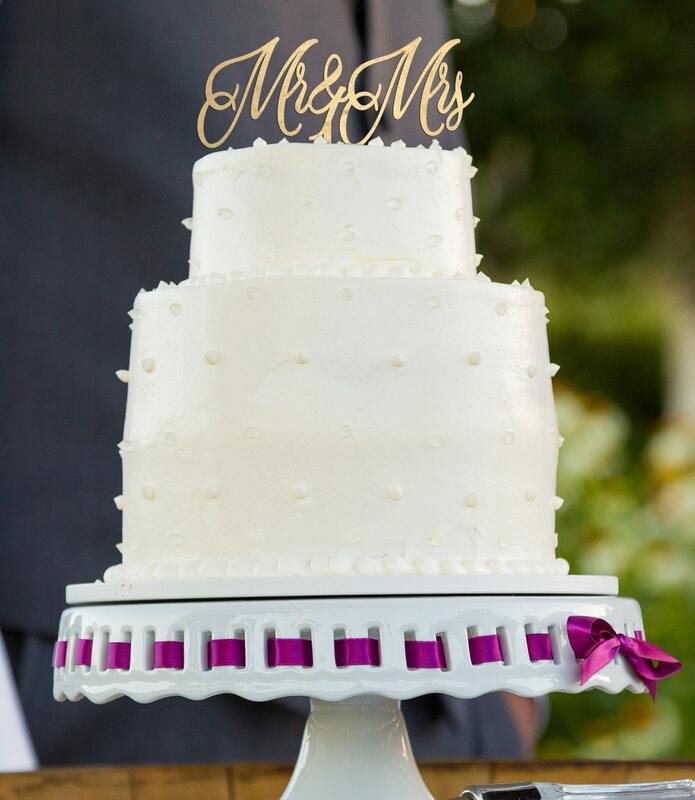 If you order a painted cake topper it will come painted on both sides. We hand airbrush all of our products with non-toxic paint and seal the sticks. Please kindly read all policies and keep in mind we are located in Southern California. If you are from a country other than the United States, please know that your country may charge you customs, duties, and taxes on your order. These duties and fees are your responsibility. These are fees that we cannot quote you for and that we will not be held responsible for. We ONLY charge you for actual shipping fees. Returns and/or refunds will not be accepted due to customs fees. If you need your item by a specific date, please message us to ensure we have this item in stock and can get your package to the post office in a timely manner. PS Weddings and Events is not responsible for the amount of time it takes them to ship it to you. We are not able to control the Post Office, Postal System, or Postal Workers/Couriers. As a result, we will not be held responsible if your item does not make it in time. If you purchased an item and need it by a certain date, within a 1 ½ week period, YOU will be responsible to pay extra for express shipping. If we do not hear back from you by the start of the next business day, we will ship your item first class mail. For those interested in doing photo exchanges, you must pay full price at time of purchase. We will issue up to a 15% refund (of a single item cost, for item photographed) after we ensure the photo meets our standards. Photo must be a clear, in focus, high resolution image of one (or more) of our product(s) purchased. PS Weddings and Events holds the rights to refuse photos that are not professional or do not meet our standards. By either sending us a photo or tagging us on social media, you are giving us permission to use it on all of our social media outlets as well. If a photographer or decorator would like to be credited for the photo, please send their information with the photograph. Also, if the picture features another product from a different Etsy seller we'd be happy to credit them in the photo as well! If you have purchased any of our items, you are responsible to supervise any child/children with this item. If an item is broken, it may become a choking hazard if swallowed. Therefore, should any injury or accident occur to any child/children, PS Weddings and Events or any affiliate or subsidiary of the same (company), it's officers or their insurance company will NOT be held responsible. By purchasing our items, you have read all shop policies and assume all responsibilities for supervising any child or children with our product. We Accept, Paypal, Credit Cards & Etsy Gift Cards. Please feel free to make your payment online with any major credit card, or your PayPal account. If you choose to use PayPal, you’ll get a confirmation email from them saying your payment has gone through successfully. If you don’t get this email, something went wrong and you’ll need to contact us ASAP so we can look into the matter. We are not responsible if items have been shipped to the "wrong address" because the buyer has not updated address (after a recent move, or whatever the case may be). No refund will be given since it is the responsibility of the buyer to have entered their information properly. If the item is not shipped back from the wrong address you will have to purchase a new item. We will not be responsible for lost or stolen packages unless USPS tracking has indicated it has been rescheduled to be returned back to us. ♦ Priority Packages (USPS Priority 1-3 Day) come with up to $100 of insurance. "Delivery dates are an estimate only, and don't come with a money-back guarantee. The dates are based on USPS Service Standards, your selected Ship Date and Mailed From ZIP Code, and exclude Sunday. Estimates may not be available for all Priority Mail Express destinations." We want you to rest assured that we take great care in handling your precious cargo. It’s important to us that we get it to you in time for your event. Unfortunately, USPS can delay the shipping at times, so we cannot be responsible for this. Most orders arrive on time and intact. In the event that USPS has delayed your order, there is nothing we can do. It is out of our hands at that point. This can be worrisome, but there is a way to calm your nerves. You have the option to purchase insurance to make sure everything goes smoothly. For a few extra dollars, pending on the amount of the item purchased, you can have this piece of mind. If this is something you’d be interested in, please send us a message and we’d love to talk to you about the options you have. We will not be responsible for lost or stolen packages unless USPS tracking has indicated it has been rescheduled to be returned back to us. ♦ Standard Packages (USPS First Class 3-5 Day) DO NOT COME WITH INSURANCE COVERAGE, but may be added upon request. All US domestic orders come with tracking. You can track your order through the USPS website. We will not be responsible for lost or stolen packages unless USPS tracking has indicated it has been rescheduled to be returned back to us. If you are from a country other than the United States, please know that your country may charge you additional customs, duties, and taxes on your order. These duties and fees are YOUR responsibility. These are fees that we cannot quote you for and that we will not be held responsible for. We ONLY charge you for actual shipping fees. Returns and/or refunds will not be accepted due to customs fees. We will not be responsible for lost or stolen packages. Our default shipping method for International orders will be USPS First Class International. This is the most economical option, but DOES NOT INCLUDE TRACKING, DOES NOT INCLUDE INSURANCE and DOES NOT INCLUDE DELIVERY CONFIRMATION. Once you receive your item(s), you will need to open the package within 24 hours of it being delivered, to verify if everything is as you ordered it. You will see that the item(s) will be shrink wrapped onto multiple pieces of double corrugated cardboard then sandwiched between another set of double corrugated cardboard. You can cut taped sides to reveal the shrink wrapped item(s). If there are any problems with the quality of the item(s), please inform us by messaging us and sending a photo of the product in the shrink wrapped packaging as well as the box it came in for our records. If you inform us after the first 24 hours of your item(s) being delivered, we will not be held responsible for sending a new one or refunding you. ✰✰✰Once you have opened your package and are thrilled with it, we highly suggest you leave items in the shrink wrapping and replacing the cardboard back on the top and taping it back together to ensure its safety until your big day. Keeping it in the box we mailed it in will also help in keeping it perfect on the way to your event or to a vendor. ► For a REFUND, the buyer must pay for the return shipping. We must receive the returned items in their original packaging and in perfect, like-new condition. Once we have received the returned item(s) and can confirm that it is in perfect condition, you will be refunded for the item price, minus a 15% restocking and handling fee. After we have agreed to your return, please send us our item(s) back using an insured shipping method. If the item(s) returns damaged, and was not sent insured, we will deduct the damage cost from any exchange or refund amount. ► For an EXCHANGE, the buyer must pay return shipping AND exchange shipping. We must receive the returned items in their original packaging and in perfect, like-new condition. Once we have received the returned item(s) and can confirm that it is in perfect condition, you will be refunded for the item price, minus a 15% restocking and handling fee. After we have agreed to your return, please send us our item(s) back using an insured shipping method. If the item(s) returns damaged, and was not sent insured, we will deduct the damage cost from any exchange or refund amount. ► Cancellations are ONLY accepted if we are notified within three (3) days of your purchase. ►Orders that have already been shipped CANNOT be cancelled. If a cancellation request is submitted at this point, the buyer has the option refuse the package or manually to return the item for a refund of the item price. We do our very best to describe items thoroughly, including the size and material used. We will not refund for size issues. In rare cases, exchanges can be made at your shipping cost, but this is done on a case by case basis. Please message us if you have any questions or concerns prior to making your purchase of a customized item. ►►►Due to different manufacturers of paint and computer monitors, we must mention that colors on our color chart may appear different on different screens (ie: phone, computer, tablet) and in person in different lighting situations at venues. For this reason, we have set up a listing for a sample custom name which may be painted in any of our colors or sent DIY so you can see them in person! We offer custom orders and bulk orders. If you’d like us to make you special signage, to hold, to stand alone on a table, to fit in a vase, to hang on a wall, hang on a chair, or to lean against items…. We are more than capable and excited to do so. Just send us a message so we can work out the details and create a gorgeous day that you’ll never forget. If you’d like us to send you the design we’ve custom made for you, before we make it, you will need to pay an additional fee. Our design style is elegant, as you can see through our shop. Please trust that we will pay close attention to detail and ensure that you get a product you will rave about. ***Please be sure that the address you have on file is the one you'd like your items shipped to. © All intellectual property owned by PSWeddingsAndEvents. All rights reserved. DIY means DO IT YOURSELF. This means you will receive your items unpainted. So, you will have the ability to paint them that special color OR just leave them RAW for more of a rustic feel! We do NOT supply the paint needed for this project. Should I order DIY or painted? If you are on a budget, or want a color we don't offer... DIY is the best option for you. If you have enough on your plate, and want one of the colors we offer, then we'd be happy to paint them for you! We only offer gold, gold glitter, rose gold, rose gold glitter, silver, silver glitter and black. What colors do your items come in? You can choose the colors from the drop down menu next to the photo in the listing. We offer gold, gold glitter, silver, silver glitter, rose gold, rose gold glitter, black, and DIY (raw pressed eucalyptus wood). **Due to different manufacturers of paint and computer monitors, we have must mention that colors on our color chart may appear different on different screens (ie: phone, computer, tablet) and in person in different lighting situations at venues. For this reason, we have set up a listing for a sample custom name which may be painted in any of our colors or sent DIY! I am ordering multiple items, how do I combine shipping? Any additional information I should give you? Please leave your wedding/event date in the "note to seller" section at the time of purchase, as well as a date you'd like to have your item(s) by. This will be a great way to keep us on track. Thank you in advance! How soon should I order? 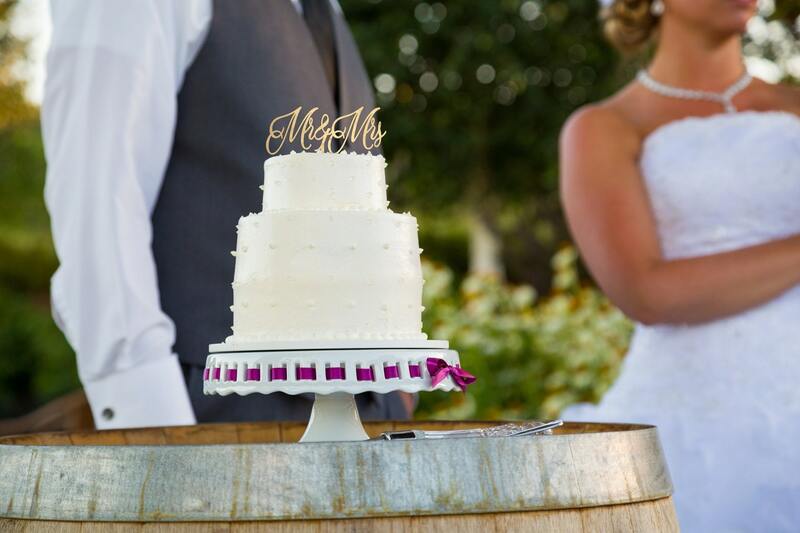 We suggest you order 2 weeks prior to your wedding/event. We are quickly approaching wedding season, and will be pressed for time. We work long hours and want to ensure you get your items in plenty of time. Yes! We love seeing our items in use! So, if you send us a photo from your special day, or tag us in that stunning shot on any of our social media sites, we will happily send you a discount code to use for your next purchase that's good for up to a year! Please note we'd love to see our items being used at the event! It's so much fun to see all the different ways our customers choose to use our products. It warms our hearts and brings us so much joy to see what you've come up with. Thank you for sharing your precious moments with us. We adore each and every one of you. We were super pleased with the cake topper. It came in plenty of time, quickly and just how I pictured it to be. Thank you! It is the perfect size and such a great color. Received it when I thought I would as well. If I ever need another cake topper, I know where to go!